Flight disruption in the form of delays, cancellations, denied boarding or missed connecting flights often means that, under EU regulation, passengers are able to claim a compensation of €250 - €600. For these claims to be valid against the airline, the airline itself must be responsible for the disruption - if they did everything possible to keep to the scheduled flight plan, and the delay was caused by extraordinary circumstances, they have no obligation towards the affected passengers. In terms of flight disruptions, what are extraordinary circumstances? There are some exceptions surrounding these circumstances which may mean the airline does have to compensate affected passengers. For example, if an airline hasn't taken precautionary measures to acquire the necessary de-icing supplies to make it safe to fly, they may be required to pay compensation to their passengers. Unfortunately, this might be difficult to prove if you are not a legal aviation expert. On the other hand, you can give us the right to take up your case. We will conduct a precise assessment, access specialised flight databases containing hundreds of thousands of flight movements and weather data and submit watertight evidence to the court proving that the airline is responsible for the delay. Find below a list of circumstances for which you will get a compensation (or not). What are the conditions for compensation? Air passengers are entitled to compensation if their flight is cancelled or arrives 3 or more hours late at its destination, if the flight was cancelled or they missed their flight connection, provided they have a valid ticket. The airport of departure must be with the European Union, or the airport of arrival must be within the EU and the operating airline be headquartered in the EU. Airlines are also legally required to pay compensation to passengers who suffer denied boarding due to overbooking. The European Regulation on Air Passenger Rights applies to those travelling on business trips, those who booked a flight with a low-cost airline and those travelling on a package tour. Children may also qualify for compensation, provided they had a seat. People travelling with a free or discounted ticket obtained through a frequent flyer programme or promotional give-away also qualify. How much compensation for delayed, cancelled, denied missed connection or denied boarding flights? If the flight distance is up to 1500 km: €250 compensation for flight delay, cancellation or overbooking. If the flight distance is between 1500 km and 3500 km or more than 1500 km for intra-Community flights: €400 compensation for delayed, cancelled overbooked flights or missed connection flights. 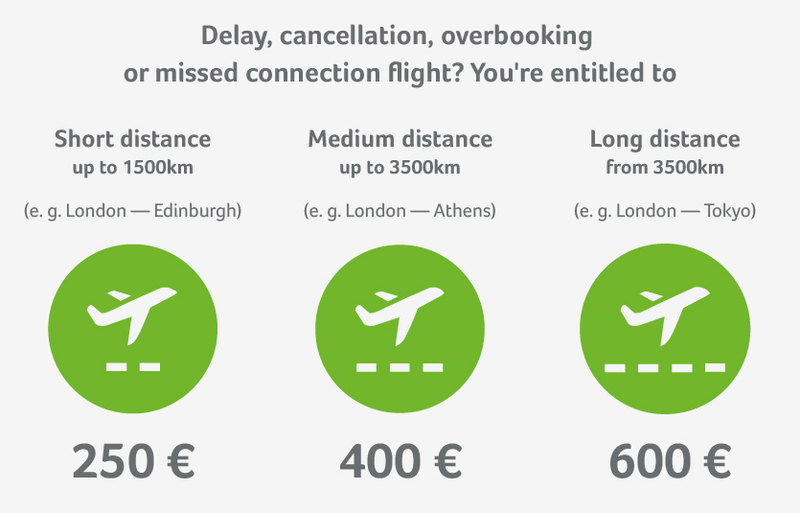 If the flight distance is more than 3500 km: €600 of compensation for flight cancellation, delay overbooking or missed flight connection. The European Regulation on air passenger rights has already been interpreted in several ways. Somewhat confused legal terms and unclear concepts such as "arrival time" or "extraordinary circumstances" make it difficult to understand and interpret, and may undermine a compensatory claim. When you wish to make a claim, it is useful to know similar cases to your own. This increases your chances of success with the airline, in particular because the case law has evolved since Regulation 261/2004 came into force. Thanks to our experience in the field of European air passenger rights, our experts take charge of your case and take the necessary steps to defend your rights effectively. In order to save you time, we offer you the opportunity to quickly estimate your chances of getting compensation using our free claim calculator. In a matter of minutes, you can see whether your case falls within the scope of European Regulation 261/2004 and whether or not you can claim compensation. If the calculator indicates that you’re eligible for compensation, you just need to instruct us to act on your behalf. Upon receipt of your power of attorney, we immediately send a claim to the airline. By choosing Flightright, you associate yourself with an expert partner at the European level, and one that is totally efficient. We know how to negotiate as equals with the airlines and we know very well what we’re doing. We defend your rights to the end, even if we have to go to court. In fact, we have a success rate of 98% for the trials we have taken on. We will only take 25% + VAT if we do deliver your compensation and you do not pay anything in the event of an unsuccessful claim, not even court costs. Further services and benefits become available if your flight is delayed over 5 hours, or if your flight is postponed to the following day, details of which can be found under the EU regulation. Checklist: When are you not entitled to compensation? There are extraordinary circumstances at play, e.g. strike, bad weather, bird strike or airspace closures. When an airline goes on strike, it is often the case that everything comes to a standstill. Hundreds of flights are cancelled and passengers are left behind at a loss - with a whole number of questions on their mind: Am I entitled to an alternative flight? Can I take the train instead? Can I get my money back? Can I claim compensation? We show you what your rights are in the event of strike.